February 22, 2013, 3:28 PM · "Everything we teach needs constant surveillance." This is what Almita Vamos told a group of Suzuki teachers on Monday at a teaching workshop at The Colburn School in Los Angeles. I think I'd like to make an embroidered plaque with this phrase and nail it to my studio wall, where I can see it always. "I throw a lot of things at them at once. If I see they can't take it, I back off," Almita said. She might give an advanced student 20 things to correct or consider at a lesson; they'll go home and fix maybe three -- and this is all right. "It's not a fast process." Bodies change, habits change, and a teacher must patiently persist. And persist and persist. About 20 Suzuki teachers enjoyed a day of Almita's teaching during a workshop presented by the Suzuki Music Association of California. In the afternoon, many stayed for a master class presented by The Colburn School, with both Almita and Dr. Roland Vamos, who presided over a demonstration of exercises from his new book, Exercises for the Violin in Various Combinations of Double-Stops. The married team both teach currently at Northwestern University and often share students between them. Persistence was the quality I most noticed in Almita's teaching. Somehow it didn't seem like nagging or judgment, but she made her points and did not back down. "Your sautillé is not quite getting off the ground," Almita told one student at the morning masterclass. The student was working on the last movement of the Tchaikovsky Concerto, which has quite a lot of sautillé (fast, bouncing bow stroke). What makes for a good sautillé? The hair of the bow is actually on the string, but the stick does bounce, she said. One achieves this with loose bow fingers, slight down-bow accent, and fingers going up and down. And, "If the thumb is not curved, then everything locks." This student was achieving a passable pseudo-sautillé, with her bow thumb locked straight. Almita didn't buy it; she insistently brought it to her attention: It's not really bouncing. Even after she had moved on to a new subject, she returned as needed: It's not really bouncing; make it bounce. And she demonstrated, often and well. Sometimes Almita was a mirror of what she wanted the student to do. While the student was playing or preparing, she would move her hand to demonstrate a bow movement, or mime a dramatic entrance for Mozart. Without words, her movements got the point across and changed the student's approach, right on the spot. "Having the technique and not using it doesn't make a lot of sense," she said at one point. In other words: do it, and do it now. Then keep doing it. If you know how to hold the bow correctly, do it. If you know how to bounce it, bounce it. Don't wait, start the good habit now. For a student playing the Lalo concerto, she advised that "you don't move the bow until it touches the string." This creates a better-sounding and better-controlled attack than if one hits the string from the air. Almita also spoke about vibrato: "Once you learn to vibrate, your search is not over," she said. "You have to refine it." When the bow does something, the left hand often should respond with a change in vibrato. This includes vibrato in Bach. 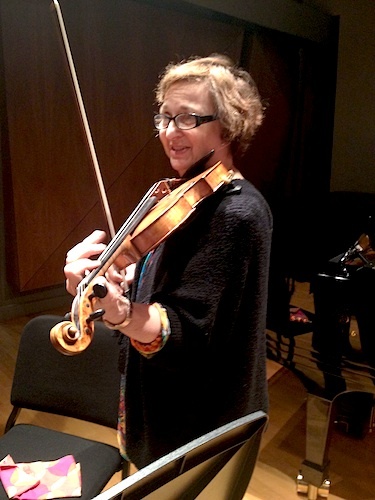 "Saying that vibrato is out of the question in Bach is not necessarily historically correct," she said. That said, one must temper it. "When you use too much vibrato in Bach, it's hard to hear the purity of sound." 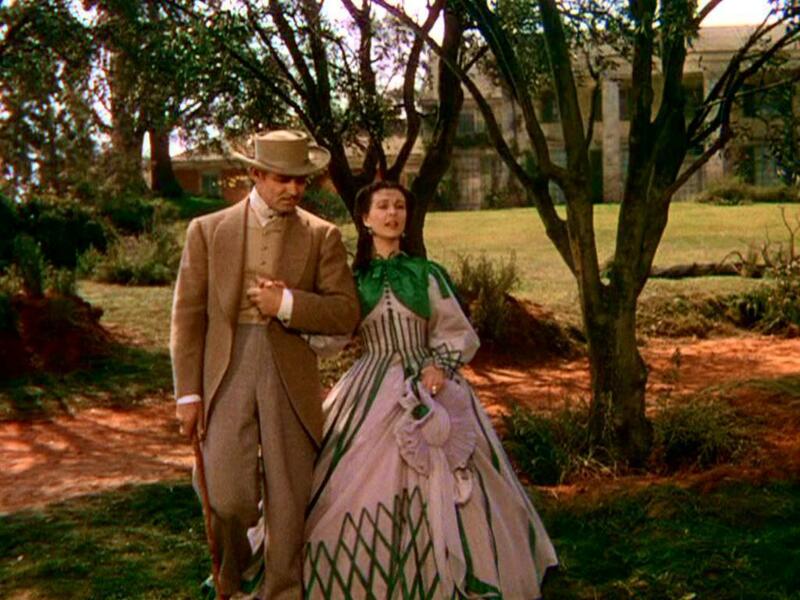 For example, the costumes in "Gone with the Wind" work nicely for a movie about a certain time period, but such clothing would not likely go over well at high school. One has to consider the times, consider the style. You don't use a Tchaikovsky vibrato for Bach. On the subject of shoulder rests: any difference in the sound is not enough to justify throwing away your shoulder rest, if your rest makes you comfortable. "It depends on your body," she advised, adding that she has many chinrests and shoulder rests at her studio, and they experiment until the student is comfortable. In the afternoon, four young students from The Colburn School played for Almita. 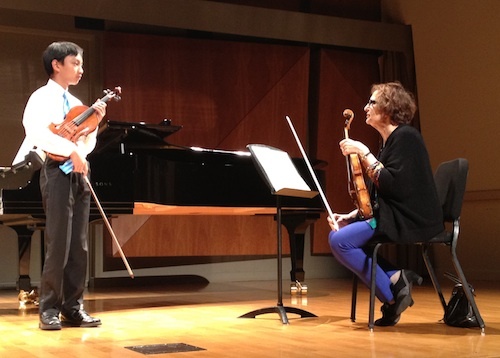 I was impressed by her sensitivity to the role of a student in a masterclass setting; to paraphrase the kinds of things she said to them: you are a good violinist, thank you for being our guinea pig, much of what is said is for the audience, please take away anything that will benefit you. A student named Geneva played the first movement of the Tchaikovsky Concerto, and Almita described her thoughts about the concerto's introduction. She likes adhering to the written rhythm, rather than playing with dramatic rubato, as many performers do. The message is simple and straightforward: "Ladies and gentlemen this is an introduction, there's going to be a beautiful melody, please sit down." Almita seems to find different angles and solutions to our common and well-studied problems on a regular basis. Working with a student named Melodi on the first movement of Mozart Concerto No. 5, she suggested starting the Allegro Aperto up-bow. Scandalous! Actually, I'd first seen this when Almita's student, Sphinx Competition winner Alexandra Switala, did it in the Sphinx Finals Concert in 2011. It's a solution that preserves Mozart's original bow divisions (check the Urtext, it's quite eye-opening) and it works beautifully -- well worth going against our 200+ years' worth of entrenched "tr-editions," yes? In the end, one has to make judgment calls; nothing is a 100-percent-of-the-time solution. If an aspect of your own teaching method is going well, or if a student is doing something that works, there is no need to change it, just to adhere to some official method or pre-planned process. "When you see sloppy playing," she said, "that's a sign that something should change." Another part of the master class with the Vamoses was devoted to a demonstration of the exercises in Roland Vamos's new book, Exercises for the Violin in Various Combinations of Double-Stops. The book is appropriate for students who are already familiar with three-octave scales and who have done some work on double stops, such as Barbara Barber's Scales for Advanced Violinists and/or Josephine Trott's Melodious Double Stops. The exercises are for advanced players; if they seem insurmountable, you (or your student) may not be ready for them. "When kids first start doing this, they are very tired," said Colburn teacher Aimee Kreston, whose students were demonstrating the exercises. "It's very difficult to do all seven exercises when you first start out." In fact, if you do too much, "you're in deep trouble and you can hurt your hand," Roland said. "Go gradually and allow your hands to develop." "If you can do all seven of those combinations, in seven positions, then you have a pretty solid command of any double stops you'll come across in the repertoire," Roland said. Almita reported that one of her students said, "I feel so strong!" after doing the exercises -- the best kind of endorsement!